Nine servings of fruits and vegetables a day are now recommended, and variety is important, as different vegetables may benefit different cognitive domains of the brain. Carrots are rich in beta carotene, which, when eaten in whole foods, may reduce the risk of some types of cancer. Carrots also ranked well in a study of fifteen types of vegetables in ability to bind carcinogenic bile acids, facilitating their removal from the body. Whether due to their beta carotene content, bile-binding capacity, or another factor altogether, carrot consumption was associated with a significant decrease in breast cancer risk in African-American women. 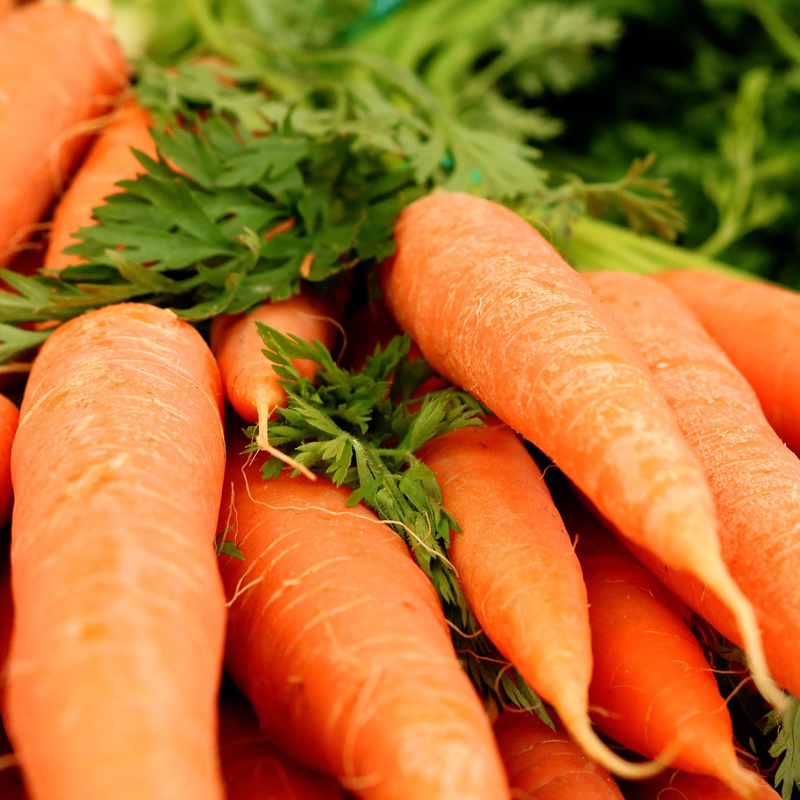 Carrots are also rich in lutein and zeaxanthin, which are important for eye health, and may be responsible for the significant decrease in glaucoma risk associated with carrot consumption in populations that traditionally eat these vegetables cooked; antioxidant availability from carrots increases when cooked, regardless of cooking method. Taking advantage of this increased antioxidant value upon heating may be particularly useful because, relatively speaking, carrots are not particularly rich in antioxidants and the nutrient values of commercial crops may have declined 15% over the last 50 years. One can also increase antioxidant intake by choosing to eat regular carrots, rather than baby carrots, as they are richer in these health protective compounds. One should note, however, that fruit, vegetable, and fruit/vegetable juice consumption—including carrots and carrot juice—may have a detrimental effect on tooth enamel. Commercial carrot juice is probably best avoided altogether, as it has been found to contain benzene, a known human carcinogen. Image Credit: Thomas Wilken / Pixabay. This image has been modified. The nutritional benefits of guacamole extend beyond just the nutrients avocados themselves contain. Five cents’ worth of seaweed a day may dramatically improve a major cause of disability and compromised quality of life among women. Is Canned Fruit as Healthy? Perhaps dietary guidelines should stress fresh, frozen, and dried fruit—rather than canned. Citrus Peels & Cancer: Zest for Life? The reason eating citrus fruits appears to protect against cancer may be because of DNA repair enzyme-boosting powers of a compound concentrated in the peel. Vegetables tested head-to-head to see which boosts immune function best.